The scheme is designed to confuse blocking schemes. However, the coverage personnel must be disciplined to make sure that they get into the appropriate coverage lanes by their landmarks. • This is a very good scheme when teams do not adjust to the huddle. • Directional kicking to areas left void as teams cover down the cluster can be effective. 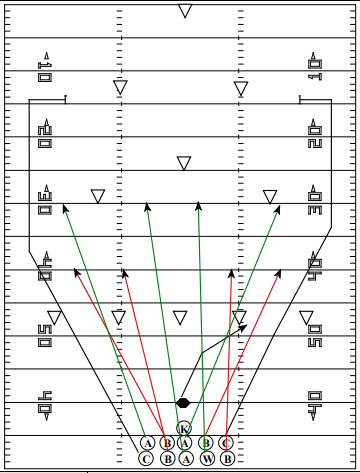 •When kicking from a cluster, it is imperative that you drill coverage lanes. BULLET: Straight for 20 yards, find the football and make a tackle. WEDGE: Use Alley technique, with an awareness of the blocking scheme. If a wedge is forming look to collide with the wedge. CONTAIN: Path is straight down the field, maintaining inside shoulder leverage, working to ball depth. KICKER: After the ball is teed, approach the cluster and then turn running to kick the ball. The kick should be made in accordance with the kickoff scheme. Follow the wave of defenders, mirroring the ball. If the returner breaks out, buy time by forcing him toward the sideline. Be ready to make the tackle! We start every Special Teams meeting with a review of the rules. We do not cover every rule at each meeting; rather we try to cover those that may come into play as we execute the scheme we are practicing. Here a few of the rules we want to make sure the players are aware of. • Stay onside–stay behind the ball (“free-kick line”) until it is kicked. All players except for the kicker and holder, if one is used, must be behind the ball. When a punt is used as a free-kick after a safety, the ball must be kicked within one step behind the free-kick line, typically the 20-yard line. it, if the kick did not go 10 yards. If the kicking team touches the ball before it travels 10 yards, this referred to as “first touching of the kick” and the receiving team can take the ball at that spot. • If the ball is kicked high, and has not touched the ground, the opponent has the right to field the ball before it touches the ground. You cannot interfere with the opponent’s opportunity to catch the ball until it has struck the ground. Note: this is why teams use the high bounce for onside kicks. Since the kicker drives the ball into the ground, the ball has struck the ground and is therefore live once it has gone ten yards. This is significantly different than a pop-up type kick because the return team has the right to field the kick until it hits the ground for the first time. • The coverage team cannot advance a free-kick, the ball is dead as soon as the kicking team recovers or catches a free-kick. • Kicks into the end zone. High school rules – ball is dead, even if touched within the field of play; College rules – ball can be run out, as such it is live in the end zone until the whistle blows. If the kicking team in the end zone recovers it, it is a touchdown. • A member of the receiving team can signal for a fair catch and field the ball without being tackled or blocked unless he fumbles the ball. • A fair catch is signaled by extending one hand only, clearly above the receiver’s head and waving the hand from side to side, more than once. • Blocks must be above the waist. • When a ball is kicked out-of-bounds, untouched by the return team, the return team can elect to take the ball twenty-five yards from the previous spot (the thirty-five yard line), or have the kicking team kickoff again from five yards farther back. • Any player who goes out-of-bounds for any reason is not allowed to touch the ball until an opponent touches the ball. • This is potentially a very emotional play. It is the only time that teams must kickoff or punt when they have been scored upon, or the offense has just taken an intentional safety to secure better field position. When we huddle along the sideline, the coach will reiterate to the players the game circumstances and what needs to be done. • The rules require a drop kick, place kick or allow for a punt. If you are using High School rules, this would allow your kicker to use a kicking tee. • We will line up our SWAT Team, using either a left, middle or right alignment. The game circumstances would dictate the type of kicker we would use, though we will always use one of our SWAT Team coverage schemes that have been detailed throughout this chapter. Again, game circumstances, opponent’s alignment, along with our scouting report will dictate which scheme we will execute.